After registering for the course, your name will be put on a course roster and all students will start receiving group emails preparing you for the overnight. This will, also, be the way to talk to each other to arrange carpools, share advice, and request rentals. If the weather conditions do not look favorable, your course instructor will postpone the class to a later date by the Thursday night prior to the Saturday start. If a storm comes in while we are camping (this is a fun thing when you’re prepared! ), we will stay in our tents through the storm (not go out unless necessary), learn how to manage tents under snowfall, and keep ourselves warm and dry. There will be an informal pack inspection to make sure you brought the needed items and that your packs are adjusted correctly for comfort. You should place the CA Sno-Park permit (two day’s worth) on your dashboards. Put glasses, lip balm, sunscreen, boots, and appropriate clothing on (there is a bathroom on the Pass, 0.2 miles east). Place chains, window scrapers, and shovels in an easy to get at location in your car. Have a snack, drink some water, and go to the bathroom before departure. Once everyone is ready to leave the parking lot, your instructor will lead the way around a forested ridge roughly following the Pacific Crest Trail to the west, then north into a little creek drainage and bowl. 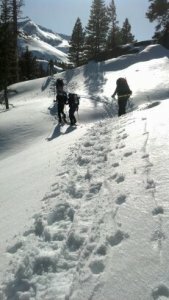 Everything that can be taught to you about snowshoeing with a pack and the environment you’re walking through will come from your instructor spontaneously as you enjoy the day. You will stop often to notice and talk about all sorts of things! We move slowly, talk constantly, pay attention to each other, and laugh often! After a snack in the bowl, we will cross the creek (snow covered!) and make a little climb up 250 feet in elevation to pass through treeless Meiss Meadow saddle and discover a surprise there. 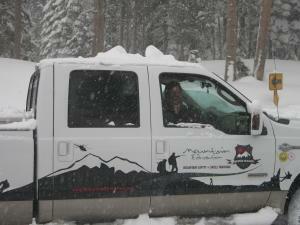 Depending on weather, snow conditions, view, and instructor decision, your basecamp may be just ahead in the trees! enjoy a hot lunch out in the winter wonderland! Take a short afternoon snowshoe hike down into Meiss Meadow to see the old barns. Playing on them – glissading and practicing ascending, descending, and traversing skills. The days are short during the winter, so by 4pm we return to camp and start making dinner! If the weather is hospitable, we will cook around the outside “kitchen” and tell stories while enjoying each other’s company. If the weather is not friendly, we will retire to our tents before sunset, cook our meals, and talk to each other through our tent walls! Lights out thereafter. Sleep well! Like during the summer, it is common to wake up around sunrise, but there is no hurry to do so this morning! Get up when you wish and join those already cooking breakfast in the outdoor kitchen. 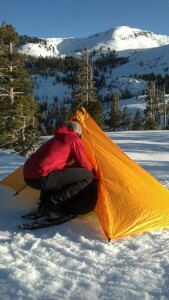 If the weather is blowing or not to your liking, feel free to cook dinner in your tents, too. 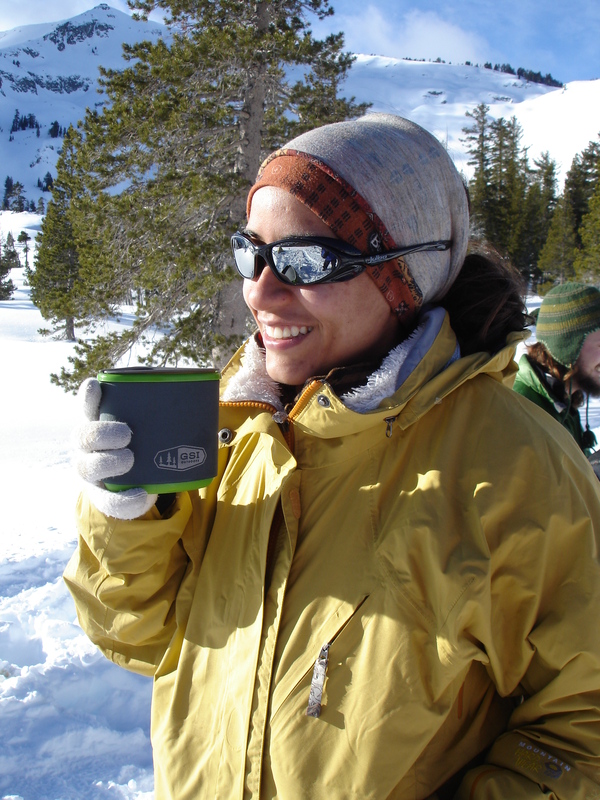 This snow skills course is all about camping on snow, so take your time and enjoy! Learn about snowpack safety assessment, evaluate the surrounding hillsides, then go play on them to gain the skills of ascending, descending, and traversing followed by the giggles of glissading down them! Not really wanting to go home too soon, all this fun will be followed by another hot lunch (all meals should be hot, so bring enough fuel) inside or out, then we will pack up and head back to the cars. Another weekend Snow Basics Course fully enjoyed! Now, go tell all your friends!